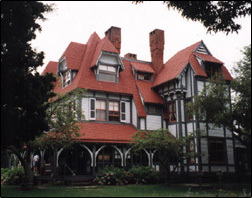 The Emlen Physick Estate was built between 1879 and 1881 for Dr. Emlen Physick, a member of a prominent Philadelphia medical family. The house was designed by Frank Furness, a well-known Philadelphia architect. It is one of the few examples of his residential buildings that have survived without major alterations. Among the house's interesting features are its varied silhouettes, multiplication of gables, hooded dormer windows, and massive upside-down chimneys. 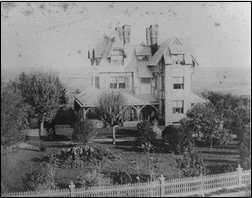 Today the house is used as a Victorian museum. 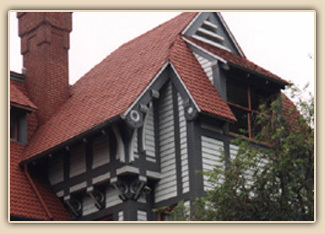 Frank S. Welsh undertook a comparative microscopical paint and color analysis of the exterior of the Physick House in the early 1980's to establish the nature and color of the original architectural surface coatings. Research was conducted by first scraping as many locations on the painted architectural fabric as possible and then removing small representative samples for microscopical inspection. Analysis and evaluation revealed a complex Victorian color scheme that used more than three different colors. The restored colors are illustrated in the photographs. A grayish reddish orange was used on the window sashes, and a light bluish gray and dark bluish gray were used on the body and trim.